It’s been another lovely week in Queensland! Summer is definitely coming quickly! 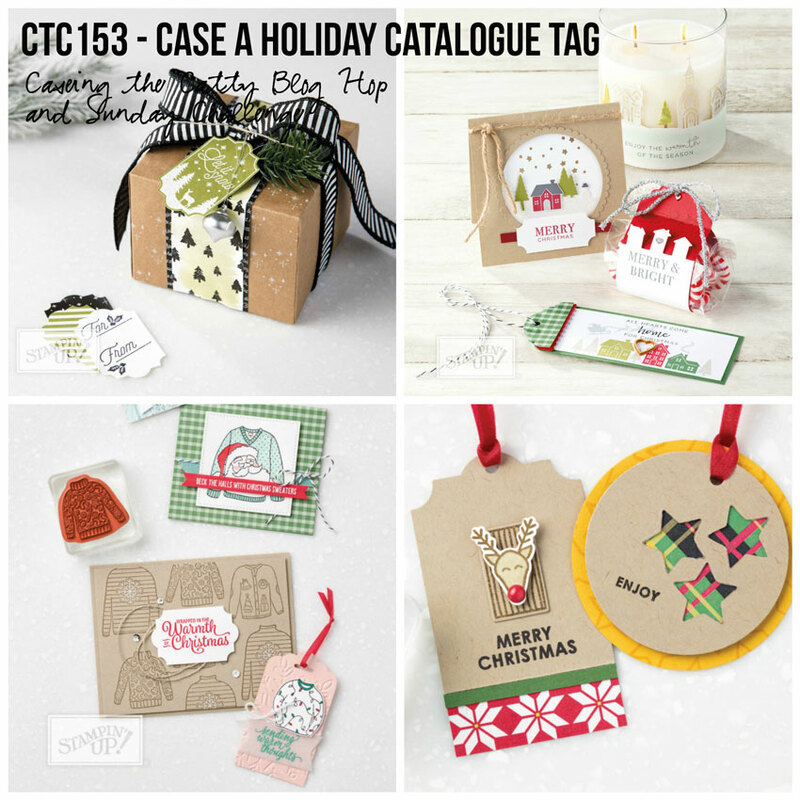 We are casing Tags from the 2017 Holiday Catalogue this week. As I was flipping through the catalogue, I realised how many tags are actually in there! So many! I actually ended up not casing a tag but casing another project and turning it into a tag. 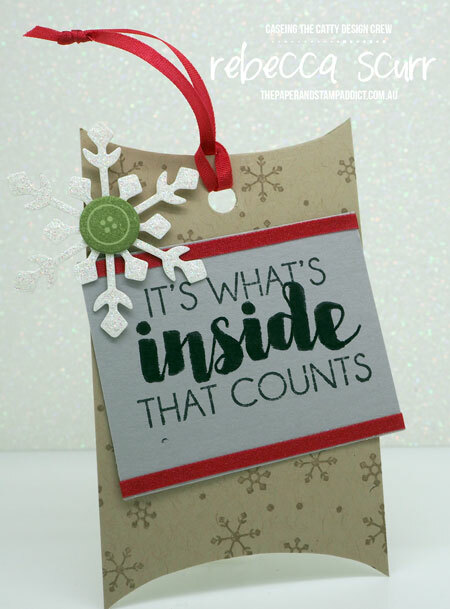 I cased the Stocking and pillow box on page 15. I love the snowflake included in this set so I had to use that! I created the base of the tags using the pillow box die and cut it by hand to the score lines. 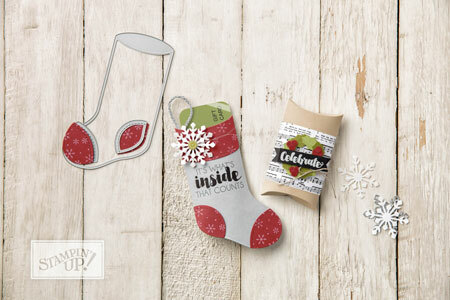 I used the lovely Merry Music Specialty DSP as the base for the wreath tag. I then stamped out the holly leaves from the Tags and Trimmings stamp set on Pear Pizzazz cardstock and Wild Wasabi cardstock. I cut them out using the dies and laid them in a circle to see how they fit. Once I was happy with the layout, I then attached them using a glue dot under the end of leaf. 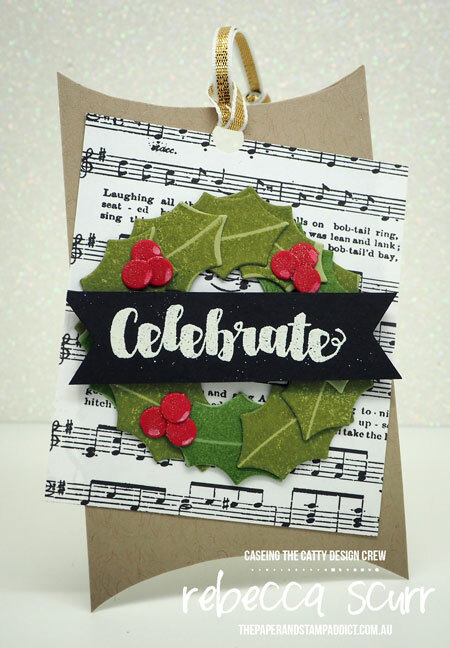 I then inked up just a part of the Celebrate the season stamp with versamark and did some white embossing on the black cardstock. I used the banner triple punch to cut the ends of the banner and used a dimensional to attach it. To create the holly leaves, I cut the trimming die in Cherry Cobbler and just carefully cut the balls off. I used the white chalk pen and then some Wink of Stella for a bit of bling. A small piece of gold ribbon and voila, all done! I used a second base of the pillow box die as before, and stamped it with the snowflake stamp in Crumb Cake. I then stamped the sentiment onto a piece of Smoky Slate cardstock. The “inside” words weren’t quite as solid as I would have like, so I used my black marker to go over the stamping. I added a piece of Real Red ribbon to the top and bottom of the sentiment piece and used it to create the hanger as well. I then cut out the snowflake from a piece of Dazzling Diamonds and the Pear Pizzazz button. I hope you like my tags today. Make sure you come and join in with the challenge at our facebook group. Make sure you hop on over to visit Peta. I love the pillow box tag bases Rebecca! It gives them a bit of a whimsy feel. What a great idea Bec. Those tags are awesome!!! Both of your tags are magnificent. You’ve done an amazing job for them both and the colours are just perfect. Ki really love the wreath on the sheet music! 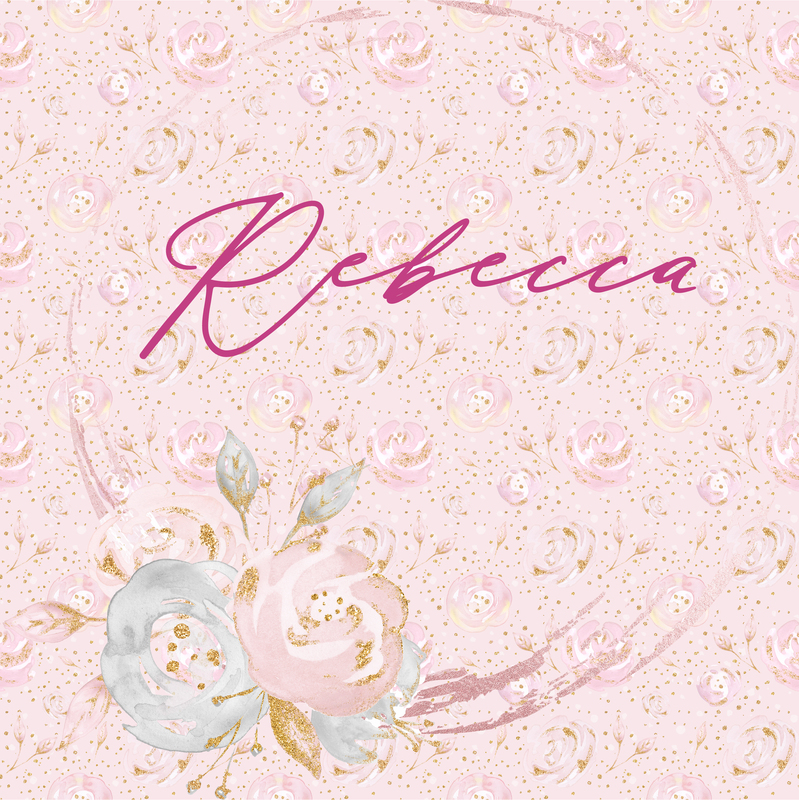 Love both of these Rebecca! Doesn’t Wink of Stella add a great sparkle to a project, love your use of white chalk pen on the berries.